"After less than 2 inches of rain in the past six months, and planting time approaching, some inundation would bring exultation for farmers in West Texas. "But that’s the 'nature' of agriculture." 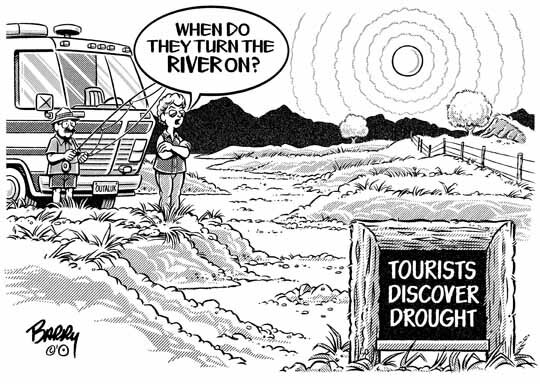 And so, I offer another DROUGHT toon here for Russell in Lamesa, Wickenburg Patsy & Lia in tinder dry Oklahoma. Seems to me that these guys are experiencing the long-heralded Global Warming in a very nasty manifestation. BTW: Have you guys tried the old trick of washing your cars? HA! P.S. On 2nd thought, I'm gonna send one more DROUGHT toon today [do I hear two more???] which will follow shortly.